An event Monday evening will mark the official relaunch of Jewish Community Watch, an organization whose mission is to combat child abuse. 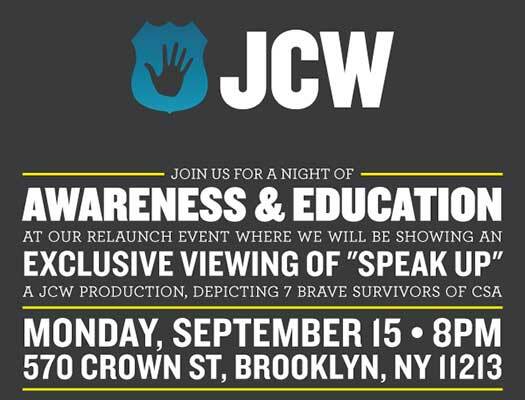 Hundreds of Orthodox Jews are expected Monday, September 15 at an event in Crown Heights, Brooklyn to relaunch Jewish Community Watch (JCW) and to raise awareness for child sexual abuse (CSA) in the Orthodox Jewish community. After mounting a successful crowd-funding campaign in July the organization succeeded in raising $150,000 in under 24 hours, the proceeds of which will go to cover a major portion of JCW’s annual budget enabling it to recommence its services. Survivors, rabbis, therapists, educators and JCW directors are scheduled to address the crowd on the issue of CSA while covering details of JCW’s relaunch including policy discussion and project introduction. A short film, entitled Speak Up which explores the stories of seven Jewish abuse survivors from the orthodox community, will also be screened. Jewish Community Watch was founded in 2011 by Meyer Seewald, himself a victim of sexual abuse, with the stated goal of breaking the silence and shame that surrounded CSA in the Orthodox Jewish community. Meyer worked with rabbis in the Crown Heights community to release the first rabbinic mandate calling for abuse to be reported directly to the police. 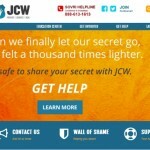 JCW’s first website was launched featuring the Wall of Shame where, after taking testimony from victims followed by extensive investigation, alleged molesters had their pictures posted to warn communities of their actions. JCW collected testimony from victims and worked with many of them to file reports with the police and to pursue justice through the legal system. In addition, the services offered by JCW began to increase to include education on CSA, awareness events and other activities. Despite its success, JCW was forced to close down in February 2014 due to an enormous caseload which led to a lack of funding. After receiving hundreds of calls and messages protesting its closure and commitments to donate towards the reopening of JCW, a relaunch plan was formulated. The plan significantly expanded its activities to incorporate a number of services including: therapy for survivors, education, private investigations headed by licensed PIs to investigate allegations of abuse, and an improved Wall of Shame. 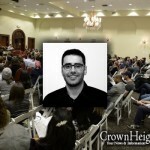 At the Monday event, JCW will detail those expanded activities as well as bring more transparency to the organization by introducing their board and defining their policies and procedures. Stalin is back? Well, every Stalin will be replaced by Khruschev, till “ruach haTumoh aavir min hoOretz”. None of the Crown Heights Rabbis are indorcing or supporting this organization. I asked two of them they told me so. They have not givin any letter of support for this organization. I’ll tell you how to protect them… You can all go to 770 on Rosh Hashanah and Daven at the White Wall! Does it matter if the CH Rabbis endorse this or not? Point is some very respectable ppl are which is necessary only to prove the validity of the org’s work. Prayer is not a sltn for us to be better. Wait for your child to run to JCW and then say “the rabbi’s don’t approve”! the only comment so far out of FIVE comments which has any tochen is #5. Succinctly said, no more needs to be added. I would not wait for the CH Rabbis to make sure my children were protected from a long time, overdue sick machla. Wait for what? till as CSA says……a child needs JCW’s services? I have no interest to see Crown Heights, with all of its great attributes (well, we will skip the weird parts and look at the part which is kan tzva HaShem es ha bracha) be infested with sicko’s who can have their sick distorted needs met by innocent children / people. AL TAAMOD B’DAM LERAYECHA. I can’t be supportive enough to JCW. Anyone who even THINKS that its possible that this meeting is about letting people talk about the miserable old days of their abuse, is in a very dark and depressing, backwards state in their own mind. Really? WHO would use this fledgling program for anything but developing a way to come lechatchila ariber…..OVER the pain and injustice and distortion, and IN to emesdik like. It is time to live in EMES. The only way to do that is to go to war with the enemy. The enemy is anyone who would do anything against another yid. INAPPROPRIATE TOUCH is against another yid. Don’t you know that? Lets remember that the old days are gone. The old days which had good lessons are not gone, but the negative ones are going away. This org will be at the forefront of it. Be proud JCM, you are doing a bigger job than you really realize. May you have much success and little need to have the success. (Tzeitzei l’milchama AL oivecha). we love you and respect you mier seewald!!!!! Maybe 2 of our Rabbonim didn’t support it, did you asked the 3rd? Did you ask why? Anyway, the community does support it! If it was your child C”VS who was a victim, you would want it to stop. And if it was your child C”VS who was an abuser, you would want him to stop and get help. Well guess what…it’s MY CHILD! We are all one family. And when a child is hurt, it’s not just the child. The siblings, parents, future spouse and children, and the entire community all suffer. If you don’t like this method, PLEASE COME UP WITH A BETTER ONE. Otherwise stop standing idly by and watching as innocent blood is spilled. People of crown heights,dont you think you should be a little less naive,abuse is something that happens,its part of life ,theres many different types of abuse, on many levels,adults as well abuse other adults verbally,this is one of the reasons the cops treat many of you guys like children,cauz thats how you act.Dont you realize that no 25 year old can stop a serious criminal behavior pattern,that exists everywhere like cancer,diabetes, etc..